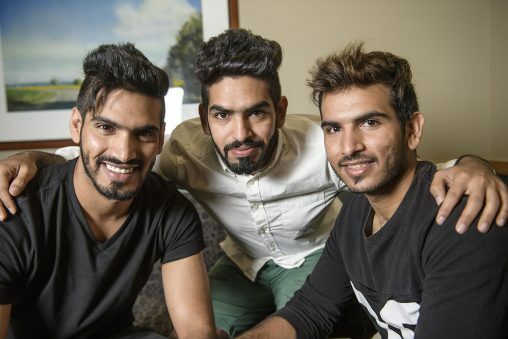 Three brothers from Saudi Arabia had each other to lean on while learning English through Wright State’s Learning English for Academic and Professional Purposes (LEAP) program. Several family members, including a husband and wife, father and daughter and sibling pair, are currently studying in the LEAP program. For brothers Mohammed Alkhiari, Faisal Alkhiari and Naif Alkhiari, English was a challenge, but one they all worked hard to overcome. The LEAP program provides full-time intensive English instruction and offers non-native speakers the linguistic, academic and social skills to be successful in an American university. The program offers five levels, limited to 10 to 12 students per class. Several different countries are represented in the program. “It’s a good place to learn English,” said Faisal, who graduated from LEAP last summer and is now majoring in supply chain management. “I only knew ‘yes’ and ‘no’ when I came here,” he added. “Now we have another language, and we can go back and teach other students.” He plans to stay in the U.S. to pursue his master’s and doctorate degrees. LEAP not only teaches non-native English speakers linguistics, the program also instructs students how to communicate effectively through helpful strategies, said Naif. Students who earn the TOEFL waiver do not need to submit an English language test score but need to meet the English language requirement by completing LEAP successfully, said Horwitz. When students reach LEAP level 4, they are able to take one academic course outside the program. Students who earn the TOEFL waiver by completing level 4 do not need to submit an English language test score for admission to Wright State, said Horwitz. As the youngest of 20 siblings, Mohammed, Faisal and Naif earned high GPAs and perfect attendance certificates while in LEAP. They not only faced academic challenges, but also confronted cultural differences such as taking classes with women, arriving on time and learning personal space. All three spoke highly of their experiences in the program, specifically for taking the students on trips around Dayton, being able to meet with American conversation partners, and hosting cultural hours during which international students bring an ethnic dish from their home country. The brothers also praised LEAP staff and faculty for their support and assistance. They listed Horwitz; Catherine Crowley, LEAP senior lecturer; Tom Fenton, instructor and assistant director of LEAP; and Mailinh Nguyen, LEAP instructor, for going beyond the norm of staff responsibilities. The brothers may have spoken highly of LEAP, but Horwitz recognized them for their personalities and work ethic.